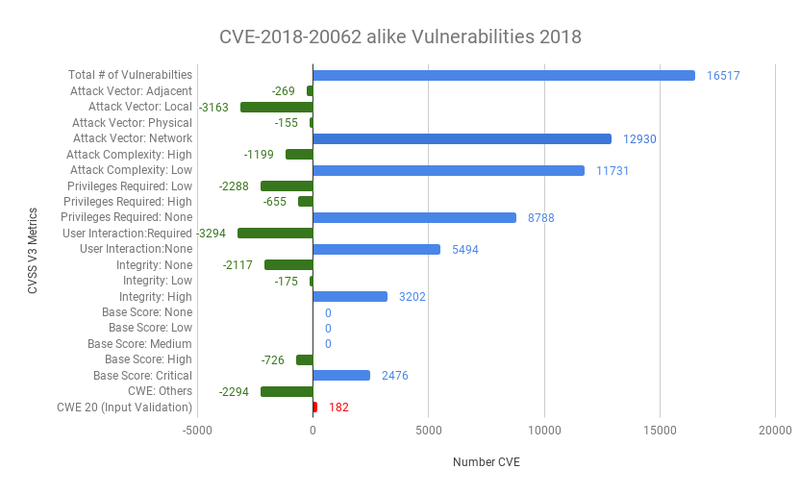 How fast must we patch the vulnerable systems? 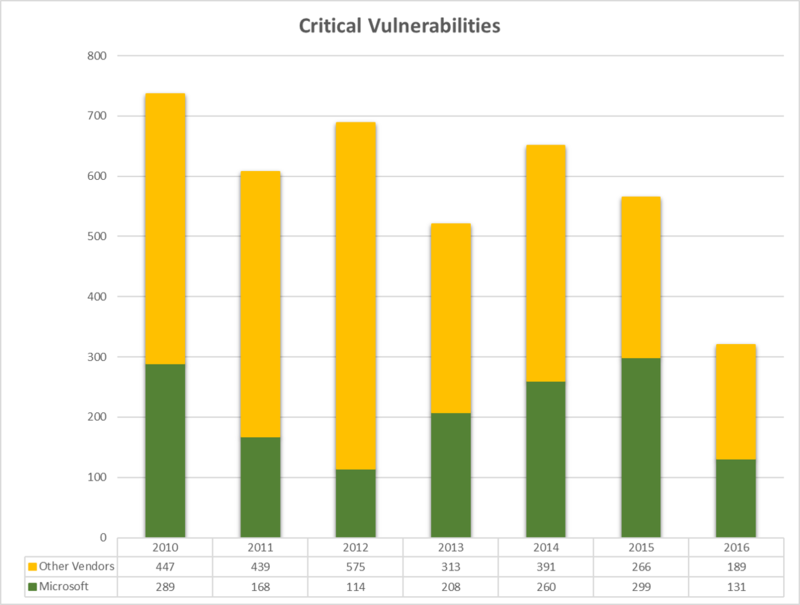 What vulnerabilities must be patched with highest priority? Or mitigated, if a patch is not available in due time. Speed is the key in cyber security. The faster we find and patch vulnerable systems the greater is the chance that cyber criminals cannot exploit the vulnerabilities. The exploit is the weapon in cyber warfare. A vulnerability as such increases the potential risk only. 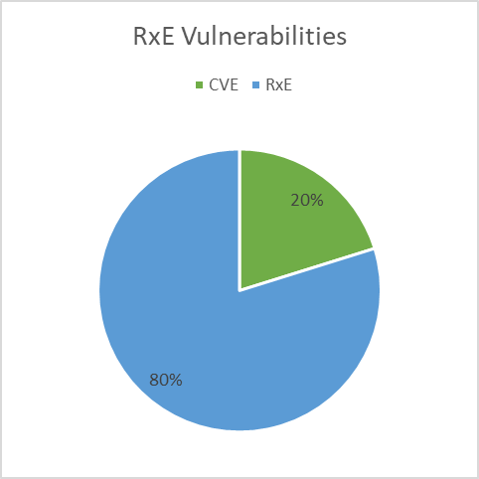 Once an exploit is published that can leverage the vulnerability, the vulnerability becomes a real risk. And if the exploit is “in the wild”, i.e. 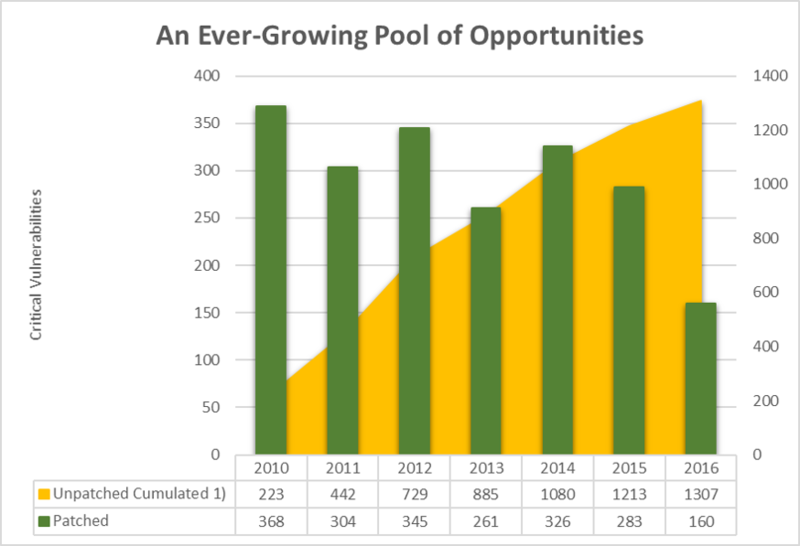 if the exploit is actively used by cyber criminals for attacks, the IT organization is on red alert. 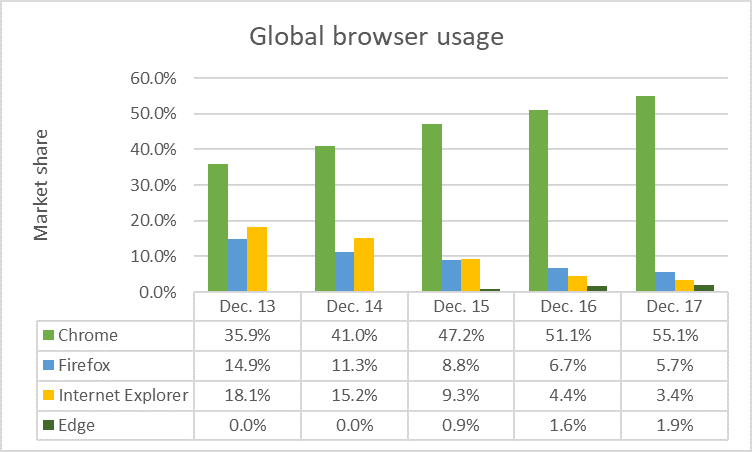 Browsers are the most critical systems because they are used in a hostile environment. Browsers are very complex applications, thus prone of errors. 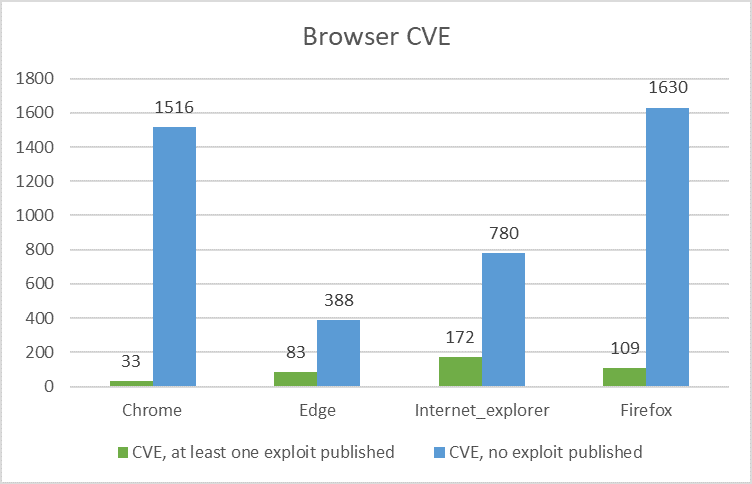 Between 2013 and 2017 about 11% of 40671 vulnerabilities in total were found in the 4 major browsers Chrome, Firefox, Internet Explorer and Edge. 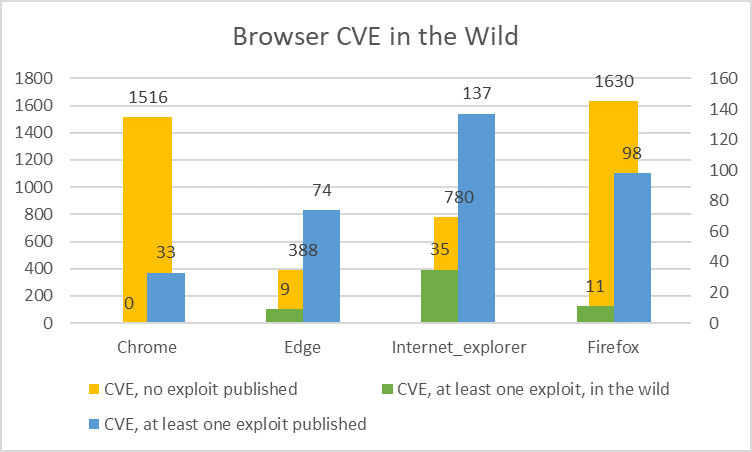 It remarkable to see that 67% of all browser vulnerabilities are related to IE, Edge and Firefox although they have only a small market share (11% in 2017). 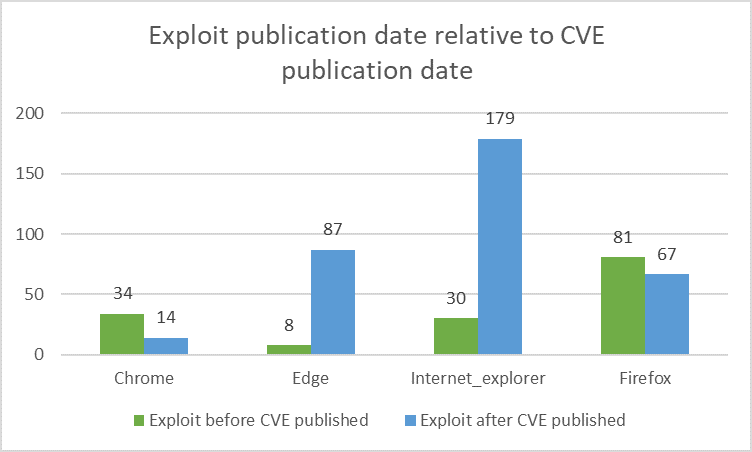 The graphic above shows the number of exploits that are published within one month before the CVE is published compared to the number of exploits published within one month after the CVE is published. 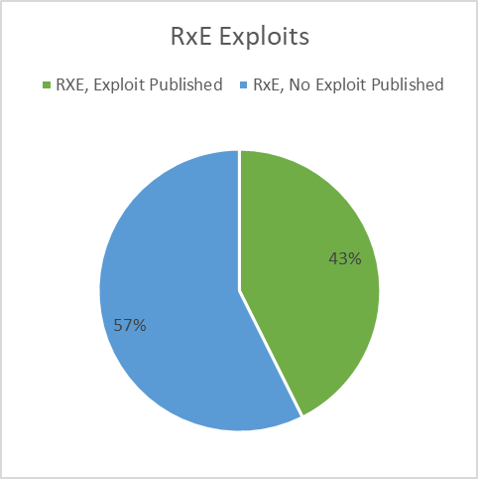 Except for Chrome and Firefox the majority of exploits is published after the vulnerability is published. Nevertheless, we have to patch immediately on publication of a CVE. This is an amazing result, isn’t it. This entry was posted in Opinion, Puzzling discussions, Survival tips and tagged Browers, Chrome, Critical Vulnerabilities, Edge, Exploit in the Wild, Exploit-DB, FireFox, Internet Explorer, National vulnerability database, NVD, Patch Strategy, Symantec Attack Patterns, Vulnerability Management on September 23, 2018 by Klaus Jochem.